Choose from a variety of cereals, yoghurts and fresh fruit or a full english breakfast cooked fresh to order, served daily between 7am and 9am. Please advise if it is not possible to eat during these times as special arrangements can be made. 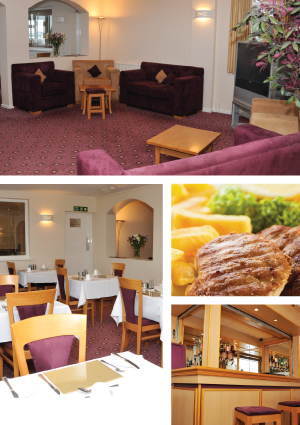 A menu offering a selection of home cooked food is available in the dining room daily between 6.30pm and 8.00pm. Freshly prepared sandwiches are also available between 2pm and 11pm. Hotel residents can enjoy a drink in the hotel bar between 6pm to 11pm daily or relax in the hotel's dedicated television lounge or bar pool room.